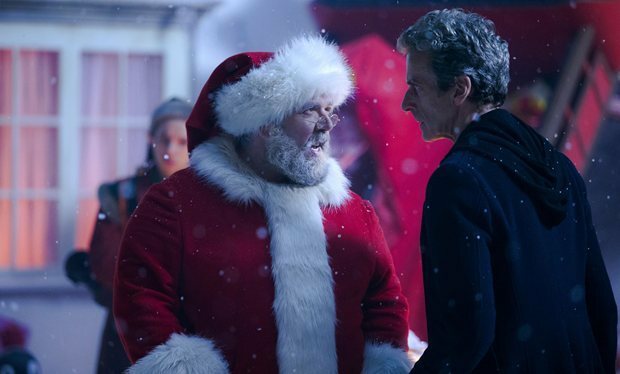 The 2014 Christmas special holds up beautifully. Lots of fun, lots of twists and turns, plot holes actually serve a purpose. Side characters are wonderful as usual, with Nick Frost of course being an inspired choice. This one is right up there with ‘The Next Doctor’ and ‘The Runaway Bride’ for sheer holiday delight. The following contains massive spoilers. Proceed with caution. 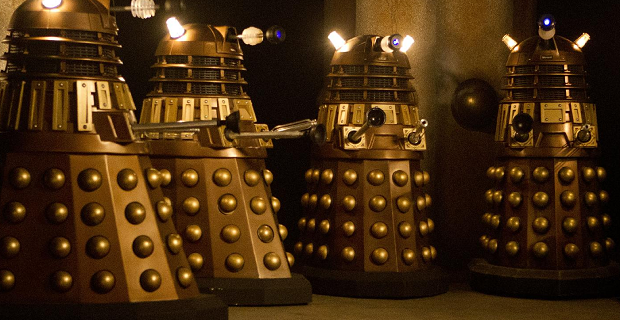 In his interview with Wil Wheaton following the ‘Dark/Death’ screening, Capaldi advised fans to brush up on their Dalek history. He was not kidding. The pre-title sting knocked us out of our chairs. Post-titles, we bring back the Shadow Proclamation, Ohila of Karn, Kate Stewart, and of course Missy. Michelle Gomez continues spectacular. The story is tight, compelling, crazy fun to watch, and wrenching. I’m a little surprised at how much history Moffat is bringing to this story. So much is meaningless if you never saw ‘The Daleks,’ ‘Genesis of the Daleks,’ ‘Journey’s End,’ ‘Night of the Doctor,’ or even just the prologue*. For lunatics like me, it’s fantastic, but I wonder how it is for newer fans. You don’t get that punch to the chest if you don’t know who Davros is. You don’t get your heart torn out if you weren’t there for the Fourth Doctor’s dilemma. (Yes, the scene is included, but it doesn’t have quite the impact without its context.) But either way, no one can believe the Doctor did what he did, and no one can believe he will do what it appears. If part 2 is half as good as this one, we’re in for a treat. Moffat is at his best with the impossible. I look forward to the Doctor’s brilliant solution. *ETA I’m referring to the prologue shown in theaters, featuring Bors. It’s not yet up on youtube as far as I can tell. I didn’t know about the other one, which is. 3D is not my favorite medium. Most of the time it feels gimmicky and pointless. That was true for the 50th, which we also saw in the theater, and about 98% of this one. The titles, however, made it worth it. Clockwork spinning past your head, the TARDIS in your face, those eyebrows! For eighteen seconds, 3D served its purpose well. As for the episode, it is mostly good. Clara’s assertion that she will never tell anyone else she loves him remains weird. Teenagers say things like that, not level-headed adults. Then she goes on to have a psychotic break and attempt murder-suicide by trapping herself and the Doctor in an active volcano. Believe me, I get grief. I get denial, I get rage. I don’t get this level of reaction. The fact that I never got what Clara and Danny see in each other just compounds the problem. It also left me bored with Danny’s emotional problems in the second part. The whole storyline is a mess from start to finish. However. Michelle Gomez’s Master is a gem, a dream of a character. Every minute she’s onscreen is a joy. The UNIT stuff is silly but fun; Osgood is always great, and I adore the Brigadier, no matter how cheesy his scene. I wept from the moment his music began. The Cybermen reveal is fantastic, and I enjoy the nods to the classic with St. Paul’s and UNIT’s old-school Cyber-head. I like that the conversion doesn’t quite work like Missy hoped: the dead of Earth, rather than become slaves of their software, stand with their own kind against her. One of the recurring themes of Doctor Who is the heroism of ordinary humans, and this is a pretty cool example. After the screening we got both S9 trailers, a humorous prologue, and an interview with the show’s two stars, conducted by Wil Wheaton and his alarming facial hair. All of these are now up on youtube, with the possible exception of the prologue, which I’ve no doubt will be soon. All are great fun, and we went home feeling we’d spent our evening well. Next up: ‘Last Christmas,’ and then on to S9! I did have one further meta-ish thought about this episode. There is a moment where Danny tells Clara he’s not stupid, the same way she told the Doctor, and a parallel begins to emerge – a parallel that is touched on repeatedly during the season. Clara is becoming the Doctor. Clara takes on somewhat different aspects of the Doctor’s character: his brilliance, his superiority, his command. She leads an army in ‘Nightmare in Silver,’ gives up everything to save a child in the ‘Rings of Akhaten,’ treats the universe with casual fearlessness, and now, keeps her companion in the dark to both their detriment. It doesn’t work for her any better than it does for the Doctor. I look forward to re-watching ‘Flatline,’ where she takes on the Doctor’s entire role, and ‘Dark Water/Death in Heaven,’ where she briefly assumes his identity. I think the main problem I have with this episode is that I don’t care about Danny and Clara’s relationship. Much as with River and the Doctor (referenced in this episode) we never see what brings them together. We never see them get to know each other better or begin to fall in love. Yet the showrunner expects us to accept them as a couple, because he says so. I fell for Rose and the Doctor, because the evolution from distrust to friendship to love was so natural and organic in its development. I even bought Amy and Rory in the end, because there was so much honest passion and emotion there – and just enough back story. But Clara and Danny I don’t get. The adventures teased in the beginning – the chains in the desert, the fish people, the running – any of them would have made a better story. Of course I also have trouble with the lying. What do you tell someone you care about when you are seeing and doing impossible things they would likely never believe? It’s certainly a barrier to having an honest relationship, as Gwen Cooper discovered. I understand that Clara wants to keep her two lives separate, which is impossible and part of the problem, but if she cares for Danny as she claims to, she needed to tell him the truth from the start. His disbelief might threaten their relationship, but her lying and continuing to lie only make it worse. I also have a problem with his extracting promises from her. What’s he doing but replacing her “superior officer” with himself? What makes him any better qualified for the job? She caves of course, as she does, though she has no real intention of keeping the promise. Clara has guts, but she fails to stand up for herself when it actually is important. Still, there is enough to like about this episode. The Doctor’s stubborn cluelessness reaches new heights. Courtney Woods is a fun addition. Three classic monsters are referenced in the opening sequence: the plastic human forms of the Autons, the single blue eye of the Daleks, the metal leg of the Cybermen. The monster itself makes for some exciting sequences. The Doctor’s rage, and his passionate defense of humanity in spite of it, is always a joy to watch. I saw shades of the Tenth Doctor in his gagetry and shouting.